In The Chinese Orange Mystery the victim was stripped naked and re-dressed with his clothes on backwards in order to hide a missing piece of attire. In The Spanish Cape Mystery, the victim is stripped naked and left naked: the piece of clothing found at the crime scene proves to be a vital clue as well as the title of the novel. They tried a mystery one way, and now they were trying it another way. The cousins writing as Ellery Queen had been easing away from the dense explanatory texts, which defined their earliest novels, and they did this with awareness. 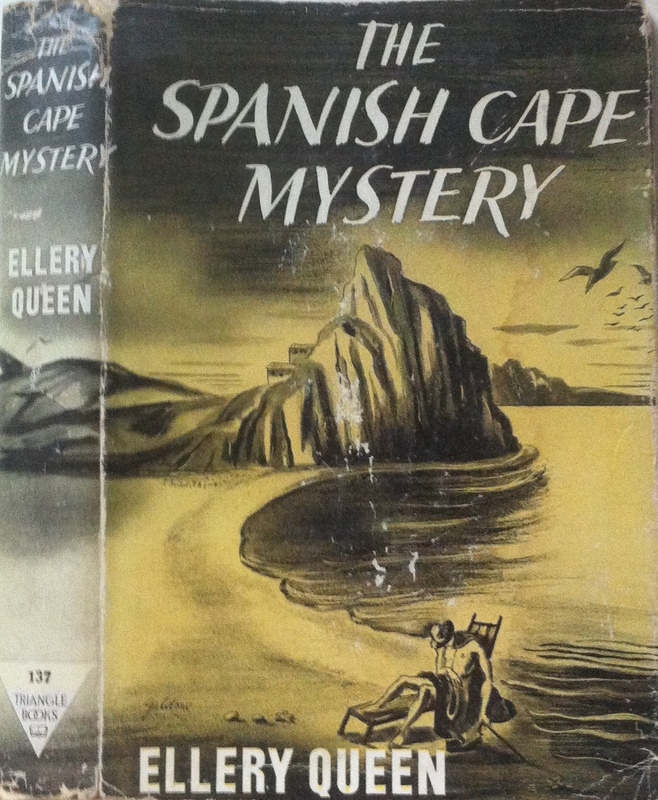 For instance, at one point in The Spanish Cape Mystery, Ellery declares, “I didn’t know; it seemed, however, a likely happenstance. Let’s defer discussion of the actual thought process; I’ll tell you about it some day. Now suppose you tell me what’s happened.” In previous novels, Ellery would have explained his thought process, and the explanation would have gone on for several pages. Plus, Ellery would never have asked another investigator for their opinion. In Spanish Cape, to be fair, Ellery arrives at a shack to find not a corpse, rather a bound kidnap victim. The corpse, apparently, is at the neighboring shack. Said shack is home to the wealthy couple, with guests galore: their daughter, her uncle, the murder victim, two of his lovers and their husbands. Rounding out the menagerie are the help, including a runaway maid and a butler deserving of his own fiction series. The local inspector responds: “If he was, he must have given the gals around here a great big thrill.” A man has been murdered, strangled to death with wire, and they concentrate about how fetching his body is, how thrilling it must have been for women to see. Really? If the novelists were more self-aware, I think we would investigate how the authors were thrilled by the idea of the naked corpse, and what this had to do with their latent feelings. Our man Godfrey decides not to act out in misogynistic violence. Good for him. But I’m starting to sound like a broken record, talking of the obvious racism and sexism in these popular novels. What I wonder at is the subtle messages I’m totally missing out on. The novel titles up to this point refer to nations. During the 1930s, I can only assume that the mention of such nations held more of a charge than they do today. What were the assumptions inherent in the terms “Spanish,” “Chinese,” “Siamese,” “American,” and so on? How would the titles have resonated differently if they had been “The Greek Gun Mystery,” or “The American Hat Mystery,” or “The French Coffin Mystery?” Were those alternate titles even a possibility at the time, or were ethnic assumptions so inbred that they did not have to be spoken, and those alternate titles would have been totally nonviable? Of course, the procedurals of those crimes would never sell newspapers, much less series of novels and short stories. And really, who can blame him? For starters, the naked man isn’t even naked! Donald Cook played Ellery, and even though Inspector Queen was not in the novel, Guy Usher played him anyway. A usual cast of B-actors filled out the cast. While The Spanish Cape Mystery was certainly not the cousin’s best effort, the movie was much, much worse. Don’t take my word for it. Watch it here! Another of Ellery’s “Eureka” moments. He’ll have another in “Halfway House.” His deductions are logically solid, but how many people today know about opera capes? This one would date quite a bit, even more than some of the other early EQs. It is, however, the first one where Ellery admits that the human equation does mean something to him, not just logic and facts, as much as he likes to pretend otherwise.